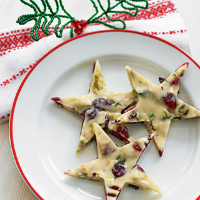 Santa will love these white chocolate stars packed with dried cranberries, pistachios and toasted almonds - and so will the rest of the family! Line a 20 x 30cm airtight container or metal tin with baking parchment, leaving some overhanging the edges, which will act as a handle later on. Bring a pan of water to the boil over a high heat. Place the chocolate and cream in a large bowl. Remove the pan from the heat and place the bowl over the pan, making sure that it does not touch the water. Leave to stand for 10-15 minutes, stirring occasionally, until the chocolate mixture has completely melted. With the bowl still over the pan of water, stir the pistachios, almonds and cranberries into the melted chocolate and mix thoroughly to coat. Spoon the mixture into the prepared container or tin and level the surface with the back of the spoon. Cover with clingfilm and place in the fridge. Leave for 1 hour or until completely set. Remove the set chocolate from the container using the overhanging parchment 'handle' and place on a board. Use a metal star cutter (about 5cm across) to stamp out 12 shapes. Keep in the fridge until ready to eat. If the off-cuts of chocolate don't get nibbled along the way, try them roughly chopped and folded through plain cake or cookie mixture before baking.